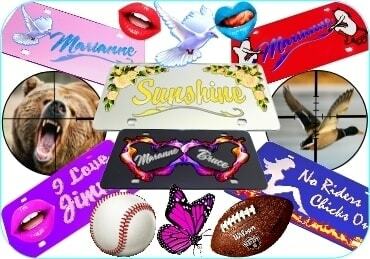 License Plates - Custom - Personalized and Logo Reproductions. Mirrored Vanity License Plates - Mirror Logo Reproductions - In this department we will reproduce a unique Mirrored Chrome Auto Tag - License Plate with your Logo, whether it is your corporate logo, school sports theme or any other special requirement you may have. 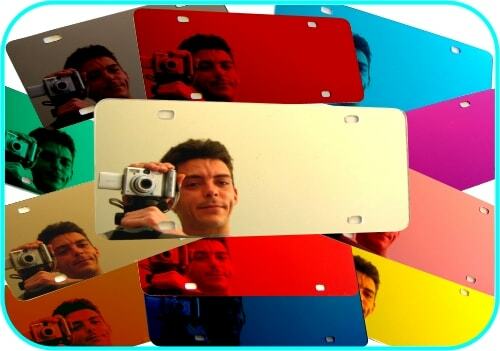 Our beautifully crafted Laser license plates, Front Car Auto Tag will make your personal statement. Our design staff will use your images to custom craft your License Plate and submit a high resolution proof for your approval Our personalized License Plates are perfect for business, sports teams or any special theme you may require. 800 838-4805 We love special requests! 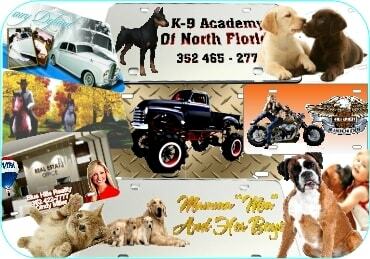 Vanity License Plates - Custom Photo Auto Tags - Depicted in these Categories is our High Resolution photo Imaging with Mirror Backgrounds and Text. Beautifully laser Crafted. 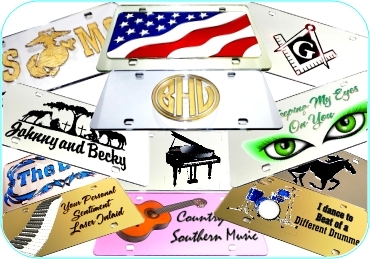 In addition to the License Plates - Front Car Vanity Auto Tags depicted we can custom craft your special theme. 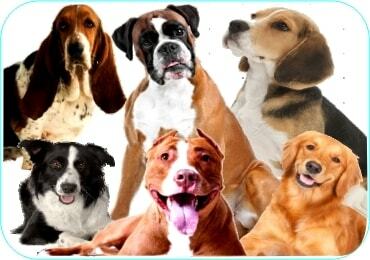 Send us your photo or image and we will prepare A proof for your review at no cost to you. Type a word into the search field at the top of any page to find any item in our online store. You could search for Heart, or Teddy bear, Key chain, license plate, if we have it in our store, then the search will find it .. try it and see. The search option is at the top of every page. Our online store makes it easy for you to quickly order your choice of products. Simply find the products you want to buy, complete the easy to use Custom Options form and add the desired quantity to your cart, click on Review your Cart and proceed to the checkout. We will ship your order normally within 5 business days of purchase. Standard Shipping is for all orders within the USA. For orders outside of the USA we will contact you to confirm the shipping amount.